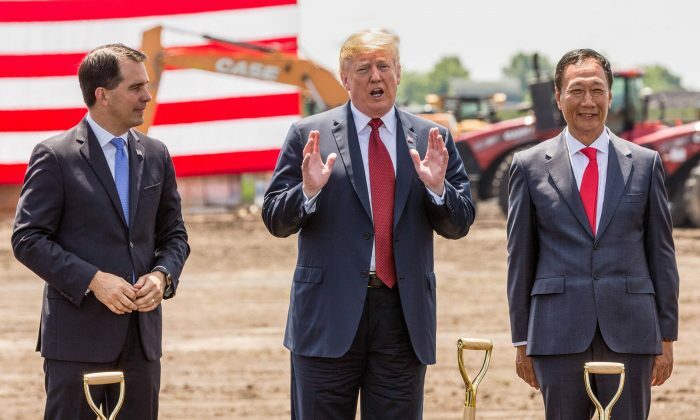 President Donald Trump joined other officials and executives on June 28 to break ground on the Foxconn’s $10-billion factory to produce flat-panel displays in Mount Pleasant, Wisconsin. “Products made here are like nothing we’ve ever built in our country,” he said. Foxconn, the largest contract electronics maker in the world, announced the investment a year ago, partly thanks to Trump’s emphasis on domestic manufacturing and support from other levels of government, according to Foxconn CEO Terry Gou, who also attended the groundbreaking. The 20 million-square-foot plant is expected to initially employ 3,000 workers and eventually expand to employ up to 13,000. Salaries will average over $53,000, plus benefits, according to Wisconsin Governor Scott Walker, who also attended the groundbreaking. The plant will make liquid crystal (LCD) displays for computer screens, televisions, and other purposes, heralding the revival of an American TV manufacturing industry that has been virtually dead for over two decades. It will focus on 8K technology, a screen resolution 16 times higher than Full HD. Foxconn employs a million people in China, where it manufactures an array of popular electronics, including iPhones and iPads. Gou previously said the U.S. plant would rely more on automation to offset higher labor costs (compared to China). The electronic display industry is well positioned for local production partly because of people’s appetite for large screens. As the screen size of affordable TVs increases, shipping them across the ocean becomes increasingly impractical. In addition to the promised jobs at the plant itself, an estimated 10,000 jobs will be created during its construction. Moreover, the plant is expected to attract additional businesses to the area, creating up to 22,000 more jobs, according to Walker’s Office. In turn, the state and local governments will award the company up to about $3 billion in tax credits and nearly $900 million for infrastructure improvements and other local costs, The Wall Street Journal reported.